This is a repost. I’m wonderfully busy with our new granddaughter, so I hope you don’t mind. I wanted to make something semi-healthy for my grandsons for Easter. I tried this recipe for chocolate chip banana muffins and was VERY happy with the results. The banana flavor is there, but does not overwhelm the chocolate. The banana flavor is in the background, but it seems to bring out the flavor of the chocolate. It’s not that many chocolate chips, but when you take a bite of a muffin it seems like there is chocolate all over the place. I would not add more chocolate chips even if you have some left over. Probably it’s because they are mini-chips that it spreads the flavor so well. Feel free to add a few nuts if you like–more nutrition and yummy. 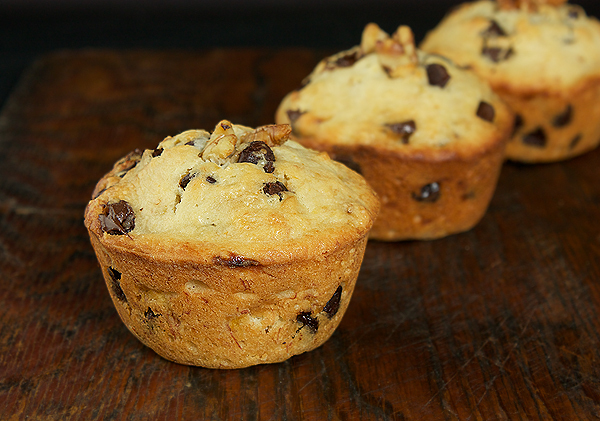 So if you want your chocolate fix with maximum bang for the buck, give these muffins a try. I’m freezing them until the night before. They should thaw nicely by morning. By the way, I doubled the recipe which, according to the recipe should have given me 32 muffins. It made 24 nice sized muffins for me. You could make them in the mini-muffin pans if you like, but lower the baking time a lot. I guarantee your chocolate lovers will love these! Click here for this 5-star recipe at AllRecipes. They would be great for any holiday. Enjoy, moneycone! Somehow having this as muffins is more enticing than making it as bread. They look nice on a buffet too. Banana muffins are something I can never get tired off! Thanks for the link! Thanks, Janine. You won’t regret it! Some muffins are dry and not worth bothering with. These are worth it! Enjoy! Cannot wait to try this! Looks delicious!